The traditional Korean medical diagnoses employ pattern identification (PI), a diagnostic system that entails the comprehensive analysis of symptoms and signs. The PI needs to be standardized due to its ambiguity. Therefore, this study was performed to establish standard indicators of the PI for stroke through the traditional Korean medical literature, expert consensus and a clinical field test. We sorted out stroke patterns with an expert committee organized by the Korean Institute of Oriental Medicine. The expert committee composed a document for a standardized pattern of identification for stroke based on the traditional Korean medical literature, and we evaluated the clinical significance of the document through a field test. We established five stroke patterns from the traditional Korean medical literature and extracted 117 indicators required for diagnosis. The indicators were evaluated by a field test and verified by the expert committee. This study sought to develop indicators of PI based on the traditional Korean medical literature. This process contributed to the standardization of traditional Korean medical diagnoses. Pattern identification is a system of diagnosis in traditional Korean medicine (TKM) that is characterized by its own theoretical basis and practical experience . This unique system entails a comprehensive symptom analysis and an investigation of the illness, its cause and nature, the patient's physical condition and the patient's treatment through four examinations (inspection, listening and smelling, inquiry and palpation) . TKM has advantages, such as one-to-one personalized care accompanying the patient's diagnosis. However, these characteristics are criticized because of the ambiguous process of diagnosis. Different ways of pattern identifications are often used for diagnosis by different Oriental medical clinicians in identical patients . Oriental medical clinicians have claimed that differences exist between Western medicine and TKM in terms of therapy and the objective for treating and diagnosing patients. However, standardized and objective methods for diagnosis in TKM are needed. The Korea Institute of Oriental Medicine (KIOM) has conducted a fundamental study for the standardization and objectification of pattern identification in TKM for stroke (SOPI-Stroke) since 2005 [4–6]. We organized a committee comprised of physicians and researchers to draft a standardized document for pattern identification in stroke (D-SPI). This research concerned the process of developing standard indicators of pattern identification. 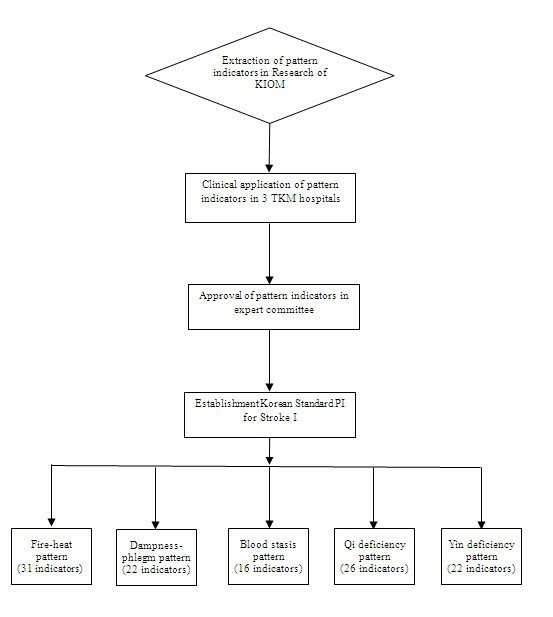 This is a primary step of collecting and sorting clinical data toward further investigation on standardization of the pattern identification. To determine important pattern indicators, the KIOM research team conducted manual searches of 10 academic sources: (1) the Dongeuibogam ; (2) A study of the standardization of diagnoses and diagnostic requirements in traditional Korean medicine II ; (3) Traditional Korean medicine diagnostics ; (4) Pattern identification diagnostics ; (5) Traditional Korean medicine pathology ; (6) A Standard form of pattern identification for stroke patients ; (7) A study of the standardization of diagnoses and diagnostic requirements in traditional Korean medicine III ; (8) The traditional Korean medical textbook on the digestive system ; (9) The traditional Korean medical textbook on the cardiovascular system ; and (10) Traditional Chinese medicine for encephalopathy . Furthermore, we investigated clinical articles associated with stroke in the Korean literature, and then developed a set of necessary pattern indicators. Unnecessary pattern indicators included motor disability, dysphagia, dysarthria, and disturbances of consciousness. Although these indicators are primary symptoms of stroke, they were unhelpful in identifying a TKM pattern. We clinically applied these pattern indicators, verifying their usefulness and compatibility. Because the indicators were composed of old language, not all indicators fit the patients' symptoms. A total of 147 stroke patients, whose demographic parameters are presented in Table 1, were enrolled from these Oriental medicine hospitals: 2 Wonkwang University Oriental Medicine hospitals (WKU OHs) and Dae Jeon University Oriental Medicine Hospital (DJU OH). All patients provided informed consent under procedures approved by the respective Institutional Review Boards (IRB NO: I-0910/02-004). We organized a TKM expert committee (EC), which was launched on January 25, 2005, for our study: the fundamental study for the standardization and objectification of pattern identification in TKM for stroke (SOPI-Stroke). The EC was comprised of 19 members who majored in TKM from 11 Oriental medicine hospitals. More detailed description of the EC is presented in Table 2. At the first meeting of the EC that played a leading role in our study, the committee discussed the necessity of this project and the study design. We compiled the CRF to include the D-SPI and basic patient information. The CRF was composed of short-form questions in Korean for all clinicians to identify patterns without prejudice or difficulty. We developed standard operating procedures (SOPs) based on the CRF. All clinicians and researchers involved in this study were educated on the CRF and SOPs twice yearly to remove difficulties and misunderstandings and to enhance the concordance rate. We notified all clinicians of contested issues presented in the education process to minimize individual prejudices and enhance consistency. Researchers composed the stroke identification patterns and subtypes of pattern identification from the related literature, preliminary study and expert advice. The results were then agreed upon by the Korean Medical Stroke Diagnosis Standard Committee. Based on several theories for stroke identification in the TKM literature, all possible patterns for stroke were surveyed. Stroke was defined as focal neurological-deficit symptoms from cerebral circulatory disorders, including unconsciousness, hemiplegia, sluggish speech, numbness of the skin and other symptoms. Five patterns were identified: the Fire-heat pattern, the Dampness-phlegm pattern, the Yin deficiency pattern, the Qi deficiency pattern, and the Blood stasis pattern. The Fire-heat pattern is characterized by any symptom of heat or fire that is contracted externally or engendered internally. This symptom can cause stroke through intense pathogenic heat and high fever. It is generally treated by externally clearing heat or internally eliminating fire. The Dampness-phlegm pattern is characterized by impeding Qi movement and its turbidity, heaviness, stickiness and downward-flowing properties. This symptom is due to the accumulation of damp phlegm in the lung and spleen in TKM. This pattern is caused by stroke and circulatory disturbances. The Blood stasis pattern is characterized by blood stagnation, including extravagated blood and sluggish blood circulation or viscous or congested blood, all of which may become pathogenic factors. The Qi deficiency pattern is characterized by qi deficiency with diminished internal organ function, which is marked by shortness of breath, lassitude, listlessness, spontaneous sweating, a pale tongue and a weak pulse. The Yin deficiency pattern is characterized by yin deficiency with diminished moistening and the inability to restrain yang, which is usually manifested as fever. Overall, pattern indicators were obtained from the above procedures (Table 3). The pattern indicators were reorganized into 22 items. These items allowed TKM doctors to easily perform four examinations in stroke patients. The 22 items were: physique, headache, dizziness, complexion, eyes, tinnitus, mouth, tongue diagnosis, throat, sputum, chest, palpitation, abdomen, skin, extremities, pulse diagnosis, digestion, defecation, urine, insomnia, temperature and sweating. These items were systematically organized from the head to the foot according to the table of contents in the Dongeuibogam, the well-known encyclopedia of TKM . Dongeuibogam (Treasured Paragon of Eastern Medicine) After the Japanese Invasion in year 1592, Heo, Joon received orders from King Seonjo to consolidate data with Jung, Jak; Yang, Ye-su; Kim, Eung-tak; Lee, Myeong-won; and Jung, Ye-nam to write Dongeuibogam. Dongeuibogam is very important book in TKM several aspects. After all procedures were completed, a draft document was composed for the standardization of pattern identification for stroke (D-SPI). Overall, 122 indicators of pattern identification in stroke were obtained, excluding common symptoms, such as exercise, consciousness, and language disorders. After the selection, the indicators were integrated with the indicator for every cause and translated into Korean. When indicators had uncertain meanings, they were written in Chinese characters. Based on the originally developed indicators, symptoms written in the foreign literature were found to have the same meaning as in the Korean literature. To determine frequency, we implemented a month-long preliminary study on 147 patients (June, 2005) in three Oriental medicine hospitals (Table 3). After this clinical field test, some pattern indicators were separated or combined, which led. Few indicators were eliminated. The remaining indicators were then discussed. The researchers developed consensus upon the Korea standard pattern identification for stroke I (K-SPI-Stroke I) to be presented at the Korean Medical Stroke Diagnosis Standard Committee on July 2005 (Figure 1), (Tables 4, 5, 6, 7 and 8). Flow chart of our research. TKM occupies an independent position guaranteed by Korean medical laws . Korea has is one national TKM school and 11 traditional Korean medicine colleges offering 6-year courses. Both the national school and colleges have their own hospitals, the majority of which are filled with a considerable number of stroke patients. Thus, we chose to standardize the TKM method of stroke diagnosis. One of the decisive procedures before stroke treatment is pattern identification, which determines the therapeutic method, such as acupuncture or herbs. Pattern identification in stroke is a series of collection procedures that involves not only specific neurological deficits but also unspecific symptoms and indicators obtained by four examinations as well as determining treatment goals after integrating all data. When the cause and disease conditions are determined using pattern identification, TKM doctors adopt proper therapeutic methods to restore the imbalance . Specific and unspecific symptoms do not tend to be visualized or digitized but assessed comparatively and synthetically during the diagnosis process . Despite this feature, a standardized diagnosis is vital for TKM. Since 1996, China has endeavored to establish standardized diagnoses to establish new criteria . However, neither developmental processes nor clinical verifications were found in the literature. This study involved verifying and standardizing clinical indicators and patterns from the classical literature. Several types of pattern identification exist, such as the cold-heat, deficiency-excess, visceral, and constitutional patterns of identification. Therefore, the first step towards standardizing pattern identification was to select only the patterns of identification most frequently observed. The diagnosis and treatment of stroke in Korea have been influenced by the publication of the Dongeuibogam, which contains medical theories of successive generations and clinical experiences from the 17th century . Additionally, on halfway through the medical exchange between China and Korea, the blood stasis pattern concept was introduced. Currently, the wind, fire-heat, dampness-phlegm, blood stasis, and deficiency patterns are prevalent in clinics . We constructed the patterns of Korean stroke considering pathological changes in TKM. Wind was excluded from the study because it is a pattern that explains the condition of a patient rather than the cause of stroke. Because deficiency has excessive sub-deficiency patterns, qi deficiency and yin deficiency, which were thought to be meaningful in investigating stroke, were included exclusively. The following step was to determine what clinical indicators belonged to each identification pattern and compose a draft from the clinical data. First, primary headings were sorted from the Dongeuibogam, and clinical indicators were supplemented from the ten academic sources frequently referred to by TKM doctors. A field test confirmed the frequency and difference between significant and insignificant indicators. Then, the Korea standard pattern identification for stroke I (K-SPI-Stroke I) was produced. Through the field test, we were able to investigate several indicators. Some indicators in the literature were unhelpful pattern identification for stroke (e.g., underweight or overweight), and some indicators required adjustment. For example, the tinnitus category needed to differentiate tinnitus intensity rather than tinnitus aspects. Also, some indicators of purse were combined due to their common combined use in clinical. It is notable that a consensus on clinical indicator measurement was obtained. Even doctors with the same medical education can potentially conduct different assessments. Therefore, we developed the CRF and SOP to standardize and digitize clinical indicators. A limitation of our study was that the concepts of reliability and validity, which are used to assess diagnosis criteria in modern western medicine , were not introduced. Additionally, the concepts of patterns and clinical indicators are rooted in the TKM literature and can generate divergences among the literature from China, Japan, and other countries in eastern Asia. Some indicators were assessed considering the feature of Korean people. A strength of this study was that we determined 5 patterns and 117 clinical indicators composed of high-frequency indicators and stroke symptoms. We aimed to determine the significant clinical indicators and distinguishing patterns of stroke. Greater focus was placed on indicators of pathological conditions than on those of physiological conditions, and we endeavored to determine clinical significance by conducting a field test and discussions with experts. Given the high probability of different levels of experience among the experts, we first produced the CRF and SOP and placed importance on education and training to eliminate differences between experts. Consequently, we developed a systematic questionnaire after the literature search, expert consensus, and a field test, which provided an example for an objective and standardized pattern identification for stroke in TKM. We shall be able to develop various standardized differentiations of symptoms and indicators that fit the actual conditions of other disease. This research was supported by a grant from the Korea Institute of Oriental Medicine (K11131). TYP conceived the study design. TYP, TWM surveyed and reviewed all pattern indicators. JAC, BKK, MMK searched and analyzed the literature. JAL drafted the manuscript. MSL and JSL helped with the previous study and critically reviewed the manuscript. All authors read and approved the final version of the manuscript.